This video was submitted by Tim Blanchard, via the CopBlock.org Submission page. 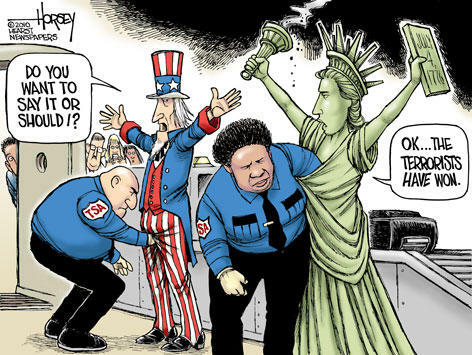 It shows an incident in which a TSA agent in Las Vegas incorrectly stated that you need the permission of the TSA agents in order to film them conducting a pat down during airport security screenings. Fact is the TSA makes it very clear on their own website that the filming and/or photographing of security screenings is completely legal, provided that the person doing so does not interfere with the screening. I was trying to record my wife getting a pat down at McCarran International Airport in Las Vegas. The TSA agents instantly tried to say that I needed their permission, which is completely incorrect. I even moved out of the immediate area when one of the agent was aggressive and came up to me. That agent followed me, but we encountered a deputy. The deputy agreed that recording an LEO is legal and supported by the 1st amendment and has been affirmed by the SCOTUS. The TSA supervisor (that the agent called for) never came, so we moved on.